Just west of Knoxville in Oak Ridge and Anderson Counties is the area known as “The Secret City”. Founded in 1942, Oak Ridge is steeped in American Military History. In Oak Ridge, it’s no secret that Rusty Wallace Honda Oak Ridge is the place to purchase your new or used car and truck. Just a short drive from Oak Ridge, Rusty Wallace Honda is the conveniently located near Oak Ridge and Anderson Counties. Our commitment to customer service since our opening in 2001 has secured our name at the top of the list for Honda drivers of Oak Ridge, TN, and the surrounding areas. Our appreciation of our loyal customers and commitment to turning our new customers into returning ones is what has made our name known throughout Anderson County and Oak Ridge. Take the short drive from Oak Ridge and stop in to view our inventory today. Rusty Wallace Honda’s customer service commitment starts the moment you pull onto our lot. Whether you’re here to browse our showroom or look around our extensive inventory of new and used cars; we are the place for Honda near Oak Ridge. Our experienced team of financiers is here to help you along the way no matter what financing option you choose. On-site and with six days of operating hours, our financing department will aid you in securing the option that works best for you. Check out the special Honda incentives on our website for additional information from the manufacturer which we update monthly. Rusty Wallace Honda Dealer Oak Ridge is committed to our customers for every car, truck, or van purchase and to making sure that that purchase fits your lifestyle and finances. 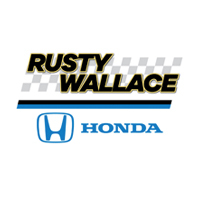 The people of Oak Ridge know, when you’re in the market for new Honda, Rusty Wallace Honda Dealership is a name you can trust. As the Oak Ridge area Honda dealer of choice, Rusty Wallace Honda has and wide-range of new 2019 Honda models, and broad lineup of used cars, trucks, and vans. The Rusty Wallace Oak Ridge Honda area dealer, our experienced and knowledgeable sales staff treat you like family and guides you from browsing our inventory through the purchase process. Our commitment and goal are to provide you with a seamless buying experience that you describe as ideal to your friends and neighbors. Look no further than Rusty Wallace Honda Oak Ridge. Rusty Wallace Honda Oak Ridge is proud to offer an on-site Service and Parts Department. Offering hours of operation six days a week, starting at 7:00 am, we are here to assist you in all of your service and parts needs. From oil changes to tires, regular maintenance, and major repairs our trained technicians will have you back on the road in no time and within budget. Rusty Wallace Honda Dealership is committed to serving Oak Ridge, TN, Anderson and Oak Ridge Counties and the greater Knoxville area. Our commitment to Honda and Oak Ridge spans from our beginnings in 2001, to today, and in the future. Drop by today and take a test drive or visit our service and parts if you’re in need. We look forward to seeing you. Explorer the 2019 Honda Accord near Oak Ridge Tennessee. Click the link below to explore the Accord and view options, colors, trim levels and Accord inventory. Explorer the 2019 Honda Civic near Oak Ridge Tennessee. Click the link below to explore the Civic and view options, colors, trim levels and Civic inventory. Explorer the 2019 Honda CR-V near Oak Ridge Tennessee. Click the link below to explore the CR-V and view options, colors, trim levels and CR-V inventory. Explorer the 2019 Honda Odyssey near Oak Ridge Tennessee. Click the link below to explore the Odyssey and view options, colors, trim levels and Odyssey inventory. Explorer the 2019 Honda Pilot near Oak Ridge Tennessee. Click the link below to explore the Pilot and view options, colors, trim levels and Pilot inventory.